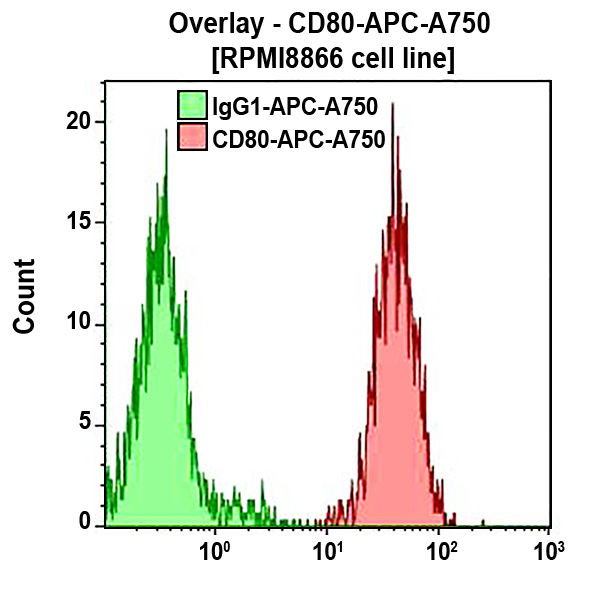 The CD80 antigen (B7, BB1) is a highly glycosylated single-chain protein. Its extracellular domain consists of two Ig-like domains. This 60 kDa molecule shares with CD86 the capability to be the ligand for two structurally similar molecules expressed on T lymphocytes, CD28 and CD152 (CTLA-4). CD80 antigen is expressed on in vitro activated B lymphocytes after 24h stimulation and at maximal level 48-72h post activation. It is not expressed on the majority of resting B cells from peripheral blood but identifies a subpopulation of B cells that has been previously activated. The antigen is also expressed by HTLV-1 transformed T cells and activated monocytes. CD80 binding provides co-stimulatory signals for T cell activation. *Alexa Fluor and Pacific Blue are registered trademarks of Molecular Probes, Inc.